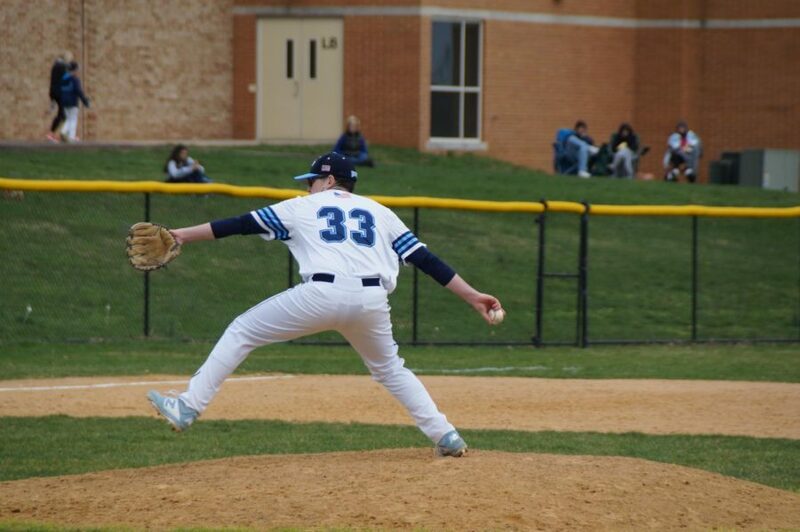 Senior Josh Lowe delivers a pitch as he picked up the win for the Knights. TOWAMENCIN- After four straight losses, the Knights needed a big turnaround to get them back on the right track and they found it at home. 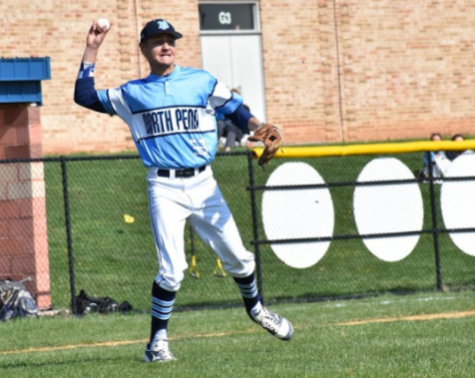 The North Penn Knights (3-4) beat the CB West Bucks (5-4) 10-2 in a home game on a Thursday afternoon. “I think today, it was just a matter of getting a little bit of confidence in the batter’s box, we came out and scored some runs early which I think was really important. We’re gonna face a lot of good teams. 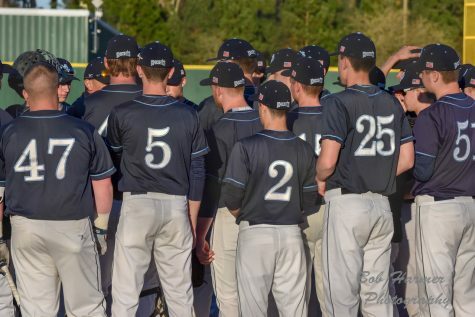 We’re gonna face CB South on Monday, they’re atop in the standings, they have a very good returning team, so we just need to get out there and make sure we put together good at-bats and stay confident,” Head Coach Kevin Manero said. 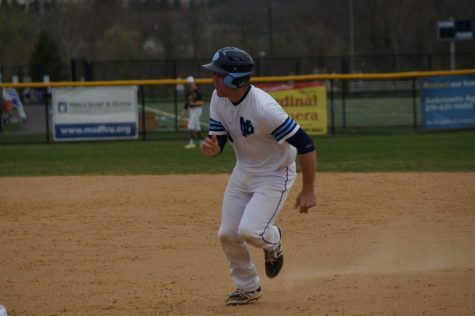 Senior 1B Jake Morello got things started for the offense in the bottom of the 1st, as he gave the Knights a 1-0 lead on an RBI double. 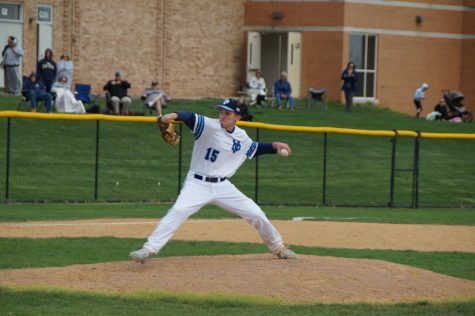 Senior SS Connor Ertel drove in junior Kolby Barrow with a productive groundout. In the bottom of the second, junior Chris McLean scored off an error as the Knights went up 3-0. Then in the bottom of the 3rd, the Knights offense sent 8 batters to the plate and scored 5 in the inning. 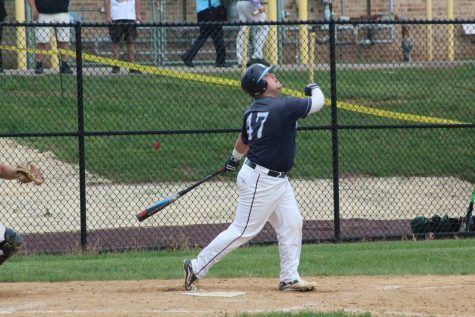 Junior RF Ryan Feiser drove in a run on a single, which was followed by a 2-RBI single off the bat of senior C Jake Drelick. 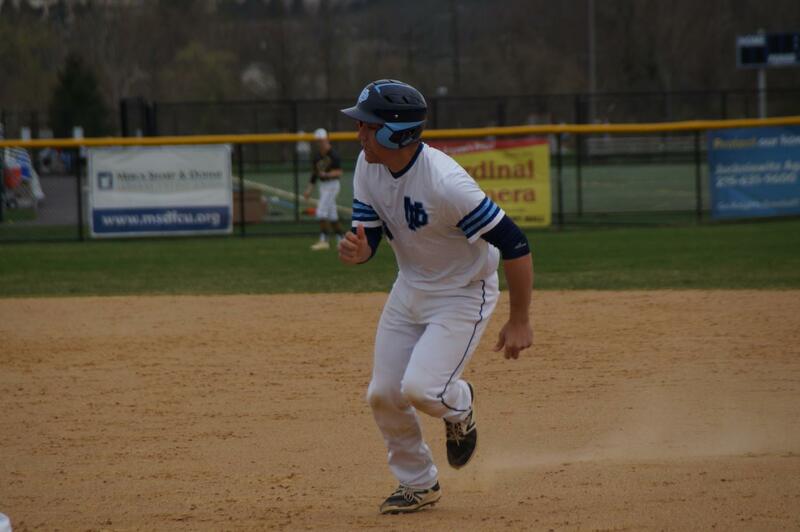 Senior Griffen Juckniewitz hit a sac fly that scored two runs due to an error. Senior C Jake Drelick returns to 1st base after a 2-RBI single. 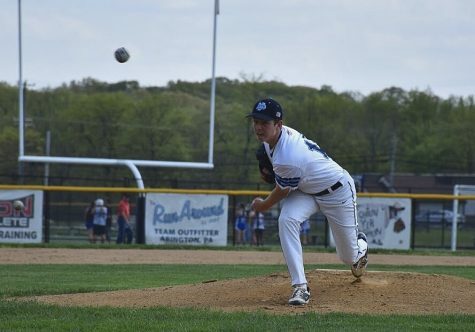 With an 8-0 lead, senior Josh Lowe had all the offensive support he needed as he found a groove on the mound. 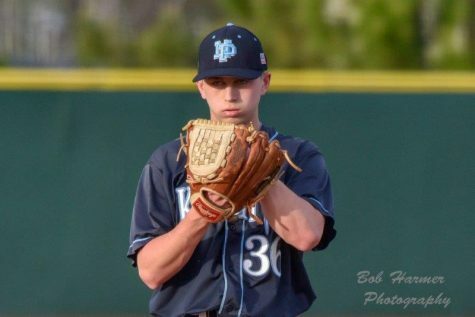 Besides a shaky 6th inning, Lowe pitched a quality game to help get the Knights back on track. He threw 5 2/3 innings, gave up 2 runs on 6 hits, while walking three and striking out 5, to get the win. “During the week, I just really worked hard on keeping the ball lower and then after that, it’s just working in the game. I worked on it and that’s what gonna happen,” Lowe said. 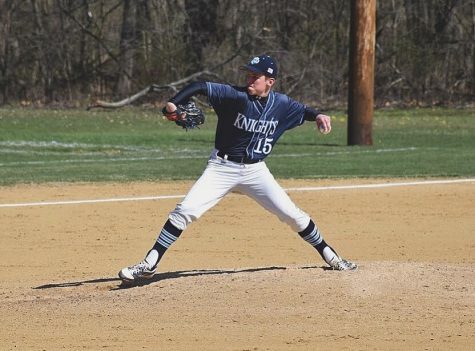 After Ertel drove in another run on a sac fly in the 4th and a run off of a Feiser groundout in the 6th, the Knights put up an even 10 runs on the board. This a big improvement after scoring only 6 runs in their last four games. “I just want the guys to know how good they are so I went through the lineup man for man yesterday and I reminded guys why they’re in the lineup and what we think about them and how long we’ve known them and what we know they’re capable of. 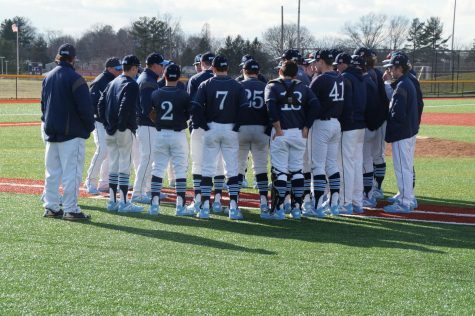 Today we went out and we did the right things and I think today, guys played up to the level that we know they’re capable of,” Coach Manero said. In the top of 6th, senior Jason Beideman came on in relief of Lowe after a wild pitch scored Tommy Comes and an RBI from Mike Bukowski. 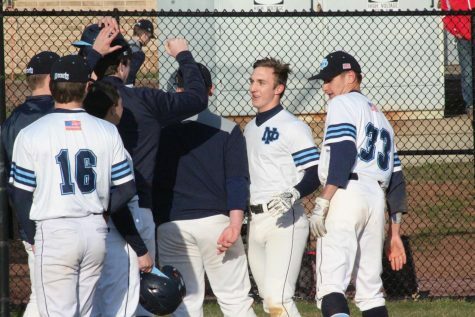 But it was too little, too late for a comeback as Beideman pitched the last 1 1/3 to send the North Penn fans home happy. The Knights will look to string together a few W’s and play the Parkland Trojans on Saturday. “We got some work to do before Monday. We’re supposed to play Saturday against Parkland, that’s a non-league game where we hopefully go out there and just kinda sharpen some things up a little bit. 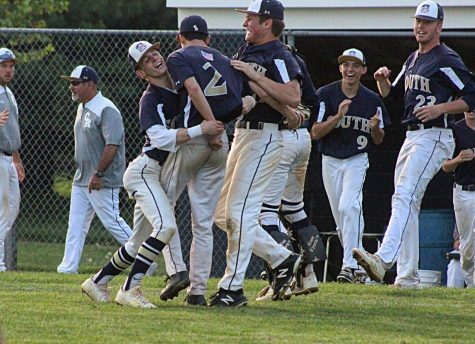 But then we get back on Monday, we just gotta go out there and we win the first inning and then we win the second inning and it’s one at a time and you just go about the business the way you prepared for it,” Coach Manero said.